This post is a continuation on our Tripods Series (read previous posts in the series at introduction to tripods and how to buy a tripod). Another option when looking for stability in your photography is to purchase a monopod instead of a tripod. Weight and Size: The portability that monopods offer is probably their best feature (coming from someone who hauled a massive tripod around for years). They are lighter and smaller and can often be thrown in a backback or camera bag (or hung off one) without too much trouble. Quick to Set up: Instead of having to pull out and secure three legs you only have to do it with one. This means when the moment comes to take a shot you can be set up within seconds. Flexibility: When using a monopod you are almost in between tripod and hand held shooting in that you have extra support to cut back camera shake but you are also less tied down and have more flexibility to move around. Less Real Estate – shooting with a tripod in a crowded situation can be a nightmare as your tripod has a larger footprint and takes up quite a bit of room. If space is an issue a monopod is ideal as it takes up virtually no space. Camera Shake – Monopods won’t eliminate camera shake. They do give more stability than hand holding a camera but at best they’ll probably only buy you a stop or three. For full elimination of camera shake you can’t go past a tripod. 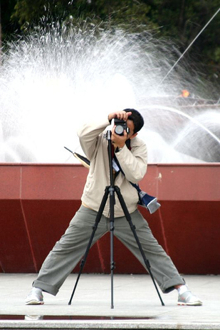 Flexibility – there are some shooting situations that shooting with a monopod can be difficult. For example shooting in vertical mode instead of horizontal is hard (unless you go for a swivel or ball head. If you’re not going to be shooting at extra slow speeds then a monopod is definitely a worthwhile option to consider. For extra stability when shooting with a monopod find a solid object like a wall or tree to lean against. This will further eliminate camera shake. Tomorrow I’ll round off this series on tripods and monopods by looking at some Alternatives to Tripods.